In Still Ill Morrissey sang, "Does the body rule the mind or does the mind rule the body?". 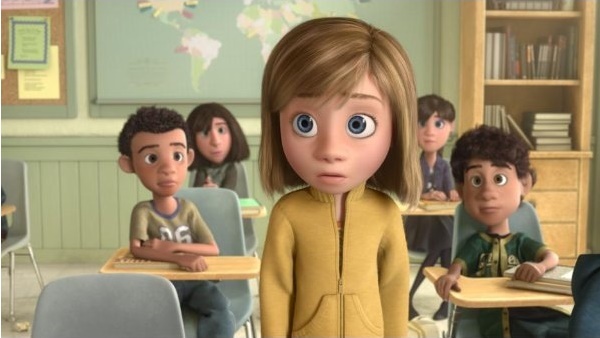 Inside Out asks the same question, an animated summer blockbuster entirely about a 12 year old girl's fears. The twist is that we experience them from inside her head, as the personifications of her emotions bicker amongst each other for control. They are Joy (Amy Poehler), Sadness (Phyllis Smith), Fear (Bill Hader), Anger (Lewis Black) and Disgust (Mindy Kaling); miniature primary coloured cartoon figures that embody each emotion. Their HQ is in the centre of the brain, and they jockey for position in an effort to influence the girl's behaviour. The actions they nudge her towards result in new memories, which appear as glowing bowling ball sized spheres, which roll down ramps and end up lodged deep within the mind. This inner world is precisely what Pixar's famed for; a fantastical scenario that's instantly comprehensible. The narrative it's in service of is almost brutal in its straightforwardness. Riley (Kaitlyn Dias) is a happy young girl who enjoys ice hockey, acting silly and hanging out with her friends. But change comes a-knockin', her family upping sticks from snowy Minnesota to San Francisco. Lonely and isolated in her new environment Riley gradually becomes homesick and miserable. Within her mind this is shown as 'Joy' being accidentally jettisoned from the mind, with Sadness in tow. Disgust, Fear and Anger are left to take the controls, while Joy and Sadness battle their way back to primacy and come to terms with each other's existence. Adaptation to changes in personal circumstances run right through Pixar's oeuvre, from Andy moving house in Toy Story to Ratatouille's Remy navigating life alone in the big city to Carl's disquiet at the skyscrapers sprouting up around his suburban home in Up. Though the particulars of each story are surreal (talking toys/rats, flying houses etc) the emotions are instantly relatable. Inside Out takes these underlying themes to their logical conclusion. This makes for an intensely focussed children's film; one without an antagonist, pop culture references and even the traditional comedy sidekick (well, sorta). The eventual thrust of all this is a fable that encourages its audience to be in touch with sadness and understand that it's perfectly natural to feel blue once in a while. This is a pleasantly emotionally mature message, Inside Out's conceit giving us a scaffold upon which we can imagine their own emotions competing for control. It's also a view of human nature where the individual is entirely a product of their environment and memories. This determinism stands at odds with the typically Manichean Disney fare of pure-hearted hero/ines and irredeemably evil villains. Inside Out isn't exactly radical cinema, but still, this mechanical psychology separates it from the subliminal Judeo-Christian value systems that lie at the heart of most children's (and lets face it, most adult's) mainstream cinema fare. It's a credit to the writers and directors that Inside Out is such an intellectually satisfying film. If it were to that standard in every way it'd be up there with Pixar's best; but in places, sadly, it comes slightly unstuck. In a rare mis-step, the character design is a smidge unimaginative, with the 'heroine' emotion, Joy looking rather like a young Marge Simpson and the rest of the emotions broadly descriptive designs that lack that special Pixar pop. This feeds into an ever-so-slightly safe aesthetic. It's as though the high narrative concept requires the environment design to be predictable in order to let us comprehend it. I can understand that, but I'd rather have seen the Pixar animators/designers let off the leash in creating a world purely of the imagination. Admittedly there is the odd visual flourish, specifically a battle through the land of abstract thought that twists and flattens the characters, or a sequence where a 'dream movie studio' is hijacked to create bizarre imagery to wake Riley up. Unfortunately these are the exception rather than the rule; the later action sequences serviceable yet uninspired. Nitpicking aside, Inside Out is an excellent piece of cinema. After the triple blows of the awful Cars 2, the disappointing Brave and the mediocre Monsters University I feared that Pixar had lost their golden touch - by my money their last inarguably excellent film was Toy Story 3, five long years ago. Inside Out restores the studio's lustre, underlining their status as a powerhouse of imaginative, emotionally satisfying cinema.